Welcome to the Warhawk air museum! The Warhawk Air Museum is a not for profit organization funded entirely by individual donations and private foundations. to the freedoms of the Western World. My visit (25Oct14) was triggered by a sign on the I-84, what good luck! Fokker D.VII, donated by Jim Osborne. of 1918. In service with the Luftstreitkräfte, the D.VII quickly proved itself to be a formidable aircraft. The Armistice ending the war specifically required Germany to surrender all D.VIIs to the Allies. last 19 victories, and in which he was killed on 21 April 1918. The Warhawk air museum has a huge collection of memorabilia and it is great fun to browse these cabinets. I found Grumman G-36 Hellcat N86572 missing, compared to this list. But others (the Cold War era jets and others) added. John Paul has owned and rebuilt several warbirds over the years. in 1986 and never lived in Montana. They have land and a cabin in Montana but have never lived there. Two Curtiss fighters and the rare P-51C are the highlights. Another correction to the above: he collection included a Wildcat (on loan to the museum) for several years, but never a Hellcat. clothing, posters, documents, models, flying clothing, uniforms, and photographs. Among one of the most famous fighters of World War II, the P-51 Mustang has its roots in both Britain and the USA. The North American P-51 did not see action with American forces until March 1943. This combination of American airframe with the British Rolls-Royce Merlin engine, it was unmatched by any other piston aircraft of World War II. The museum’s P-51C was restored to flying condition and made it’s first post-restoration flight in 2010. This aircraft can been seen competing in the Reno Air Races. The museum's P-51C is painted in the markings of Boise,ID native and 5 time WWII Fighter Ace Lt. Col Duane W. Beeson. The 'Boise Bee' and Beeson flew in the 334th Fighter Squadron, 4th Fighter Group, 8th Air Force in England. A total of 1750 P-51C’s were built before moving production to the P-51D and subsequent variations. Sue Paul wrote me: "the P-51 B’s and C’s are identical aircraft, the only difference being where they were build: C’s in Dallas, TX and B’s in Englewood, CA." This P-40E was restored in the late 1960s and first flown in 1971. It has toured air shows all over the U.S. and in Europe. It has raced at the Reno Air Races and was used in the filming of several major motion pictures including 'Death Race', 'Pearl Harbor' and 'Valkyrie'. The P-40, developed from the P-36, was America's foremost fighter in service when World War II began. P-40s engaged Japanese aircraft during the attack on Pearl Harbor and the invasion of the Philippines in December 1941. They also were flown in China early in 1942 by the famed Flying Tigers, and in North Africa in 1943 by the first AAF all-black unit, the 99th Fighter Squadron. Though often outclassed by its adversaries in speed, maneuverability, and rate of climb, the P-40 earned a reputation in battle for extreme ruggedness. The museum’s P-40N was restored to flying condition in the 1980s and made it’s first post-restoration flight in 1986. It competes at the Reno Air Races and was used in the filming of Michael Bay’s 2001 motion picture 'Pearl Harbor'. France this summer and saw and read quite a bit on these contraptions. They did a great job to save this one! Many people donated personal effects to this museum, to educate future generations. and even had tea with the Queen of Italy! WWII US Army Airforce (USAAF) portable landing lights. Here we enter the 'Cold War era' display of the museum. MiG-21FR NX1011E (c/n 061011; ex/ 1011 Cezechoslovakia). It was acquired from the collection of Merle Harold Maine, who died at the age of 81, on 20Mar2013 . *6/1971: Delivered to the Czech AF. *3/1991: Withdrawn from use at Vodochody AB. *11/1994: Sold to a private collector in America and given civilian registration N1011E. *Merle Maine Enterprises of Ontario, California. This serial 12769 translates as 51-2769, and it is a fake tailnumber, in tribute to the American Fighter Ace Capt. Robert J. Love of the 335th Fighter-Interceptor Squadron, 4th Fighter-Interceptor Group, FIFTH Air Force. F-86 51-2769 crashed in Korea on 04Jul1952. F-86E 51-2769 'Bernie's Bo' was (apparently?) also flown by Capt. Robert J. Love (335th FIS/ 4th FIW), who ended the Korean war with 6 kills - the 335th FIS was the top-scoring unit of the Korean War with 218.5 victories. Sue Paul: "Cliff Jolly was Bob Love’s wingman. The F-86 was not part of Merle Maine’s collection. It came from Minnesota in several parts and was assembled at the museum. Bob Love was a personal friend of ours and thus we decided to honor him by painting the airplane in his markings." Sue Paul: "The Mig 17 did not come from Merle Maine’s collection. It was purchased from a private individual in California, who did not have any knowledge of its history. All we know is it came from Poland originally." 1C-1417 1417, PZL Lim-5 (NATO alias 'Fresco'), formerly flown by the Polish Air Force. Stewart Lanham suggested:"Cessna c/n 22346 is registered to the museum as N5263G; this was previously 51-12032." And after closer inspection of the top image I found it does indeed wear, under the tail, N5263G as tailnumber! Stewart added: "51-11954 was last reported with the South Vietnamese AF." "It seemed but a snap of fingers, we stopped from our '56 Ford into the mouth of the Dragon". in combat during Vietnam: the 68th Assault Helicopter Company 'Mustangs'. An odd one: the Bensen B-8 (N1495) is a small, single-seat autogyro developed in the USA during the 1950s. The N3N design had its beginnings in 1934, with the first models delivered to the Navy in 1936. Built at the Naval Aircraft Factory in Philadelphia, the N3N was configured both as a land plane and a seaplane. The NAF was the only factory where aircraft and engines were built together. In addition, Sue Paul wrote: "The N3N was the only airplane the USN ever produced." be the last military serial (for the US Navy), which is indeed often wrongly quoted in the FAA Registry as a manufacturer's construction number. The aerialvisuals website has its N45305 registry to Paul C. Collins, dated 03Nov1992, and its CoA issued on 07Oct97. On 26Jan12 it was formally reg'd to the Warhawk Air Museum. "Delivered 26Apr2013 to the Warhawk Air Museum. Background: the plane, serial # 56-778, was built in 1958 and served in the United States Air Force with the 83rd Fighter Interceptor Squadron at Hamilton Air Force Base in Northern California. The Starfighter was sent on to Taiwan as part of a US military assistance program and was later exchanged by the island republic for later model Starfighter variants in 1966. The plane, now back in the US, was overhauled by Lockheed and sent to Jordan, again under a government-sponsored military assistance program where the plane remained in active military service until 1977 when it was retired. After sitting in storage for 13 years, the aircraft was sold into private hands and after passing through several dealers, was acquired in 1995 by the Merle Maine Collection of Ontario, Oregon who sold it to the Warhawk Air Museum in April 2013. The museum plans to eventually repaint it with the markings and colors it wore on its first assignment with the USAF." The Beechcraft L-23 Seminole (later designated U-8) was the United States Armed Forces designation for the Beechcraft Twin Bonanza and Queen Air aircraft in its inventory. U-8 57-6042 is no doubt a future restoration project; I found it outside at the back of the hangar of the museum I had no access to. N144LH, c/n RLH.14 and AMARC code UB 030 (partially visible here). 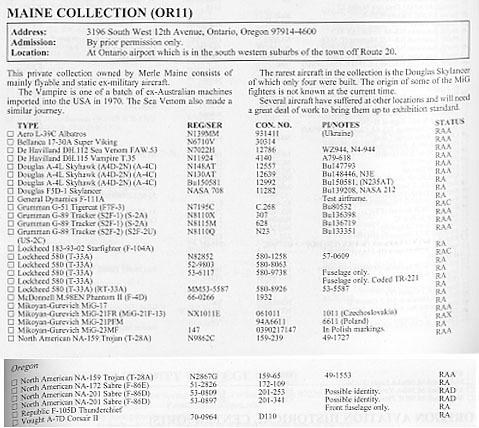 Researching the above information & aeroplanes, I became fascinated by this Merle Maine collection, partly because I did not know about it and would certainly have taken a detour for a quick peak at the Ontario airport (but I was pressed for time). So I missed it, bummer. I only have the remark of a volunteer at the Warhawk Air Museum that some of the aircraft were recently acquired from Ontario ('just across the border') of a collector who recently passed away. 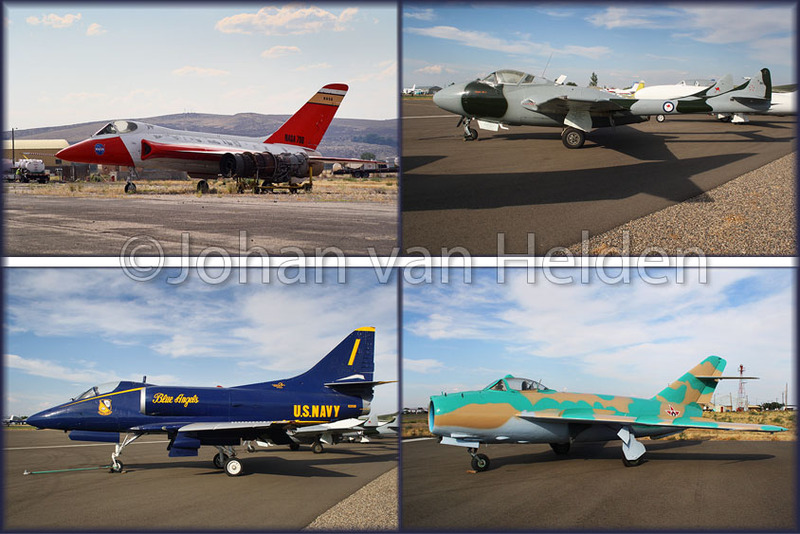 And that some of those aircraft also ended up at Boise's Military History Museum (which did not fit in my schedule). An invitation for research..
Merle Maine's collection from nearby Ontario (OR), was dispersed to. Notes to the above list (2011 edition of Air-Britain's 'Aviation Museums and Collections of North America'. The Starfighter (ex Jordanian AF) went to the Warhawk Air Museum. (*JvH*: Saw this one on 14Aug13 at the Warhawk Museum). The MiG-21FR NX1011E also went to Nampa. (*JvH*: Not noted at Ontario,OR on my visit 13Aug13). 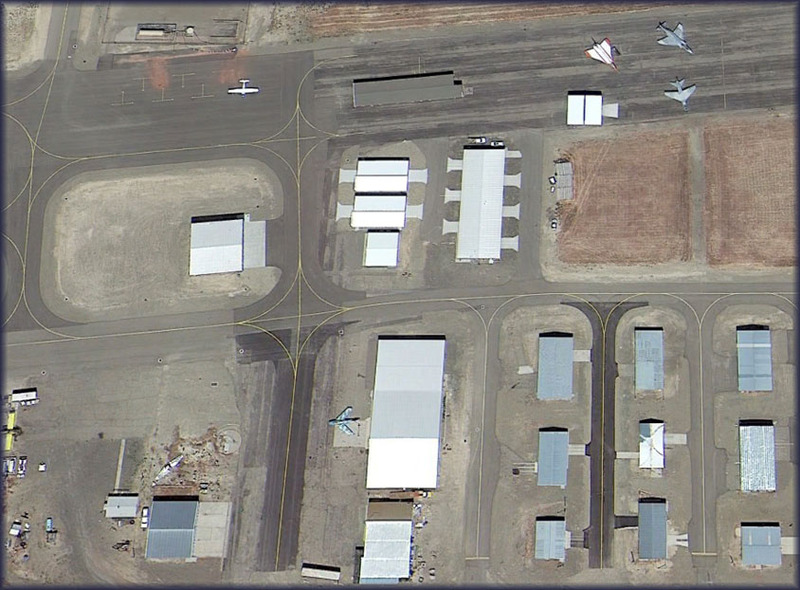 The MiG-17 seems still present going by Google Earth imagery. (*JvH*: On my photo below, no visual markings noted but is allegedly N6130Z). F-86 51-2826 went to the Boise Idaho Military Museum (new accommodations completed March 2014), their website has a photo on it (one stamped 09/19/2012). (*JvH*: Saw this one at Boise, at the military base side, marked as 81050 Idaho ANG). The above list mentions for F-86D's 53-0809 and 53-0897 'possible identity', so little to go on. (*JvH*: Both not noted during my visit 13Aug13). FAA's website has for Sea Venom N7022H a registration for Genesee Warbirds (Rochester,NY) since 02Mar2011. (*JvH*: Not noted 13Aug13). Vampire N11924 was reg'd to Boardroom Aviation LLC (Reno,NV) on 17Dec2013. (*JvH*: Was present on 13Aug13, in RAAF markings). A-4 Skyhawks: N148AT (''Registration Pending'), N130AT was reg'd 05Feb08 to A-4L LLC (Anaheim,CA) and 150581 (N235AT, still reg'd to Merle Maine Enterprises). One was a Blue Angels A-4? (*JvH*: The Blue Angels one was 1505181 /1, see photo below). The Idaho Military Museum also notes to have among the exterior exhibits a F-4 and a MiG-21. Could be F-4D 66-0266 and Polish 6611 of this list. (*JvH*: The F-4D was 66-0266/SD, present on 13Aug13). Skylancer NASA 708 was photographed still at Ontario Mun'l Airport on 25Jun2011. (*JvH*: Was present at 13Aug13, see my photo below). Tigercat N7195C was on FAA's website still reg'd to Merle Maine Ent. (*JvH*: Not seen 13Aug13). Grumman Trackers: N8110X was reg'd 21Apr2011 to Albert C Hansen (Jean,NV), N8115M (136719) reg'd 20Nov2013 to Legacy Flight Museum (Rexburg,ID - north of Idaho Falls - another one I missed!) and N8110Q reg'd 19Sep14 to Big Belly Airlines LLC (Tucson, AZ). www.s2ftracker.com (*JvH*: No Trackers present during my visit 13Aug13). Lockheed T-33s: N82852 (reg'd 06Oct2014 to William E Garrison Jr, Nickerson,KS), 52-9803 (status unknown) and 53-6117 fuselage only, plus the Italian RT-33A mm53-5587, where are they now? (*JvH*: Saw a total of 4 T33's on 13Aug13, only one had readable markings: 52-9462 in USAF markings). More unknown: Aero L-39C Albatros: ? Bellanca 17-30A Super Viking N6710V (c/n 30314): ? (*JvH*: One Albatros N139MM seen on 13Aug13; but no sign of the Bellanca). And: MiG-23 '147' in Polish markings? And the General Dynamics F-111? (*JvH*: Polish MiG-23 was present and marked 147 'red' on 13Aug13, but without Polish AF markings. The F-111 was there too, devoid of markings). Also: the Republic F-105 (no serial) ? (*JvH*: Not noted 13Aug13). 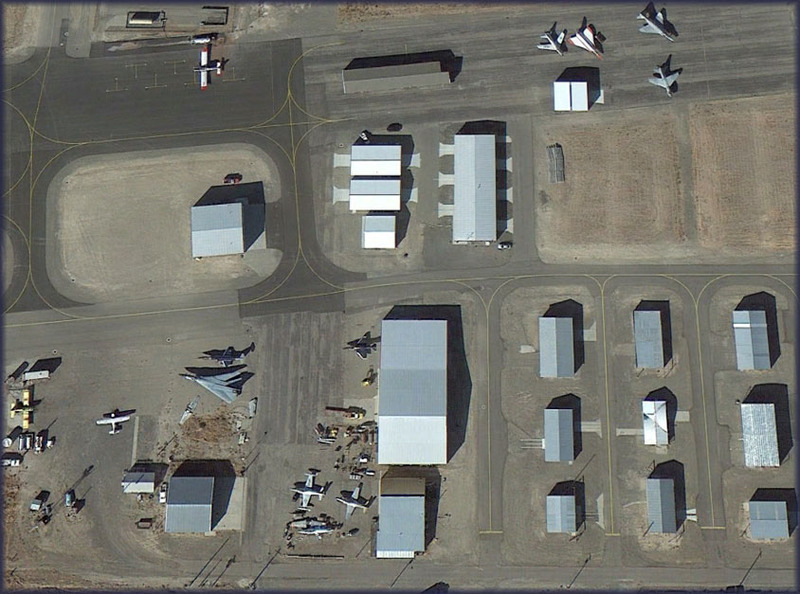 The Vought A-7D Corsair II 70-0964 is still visible on Google Earth. (*JvH*: 70-0964/SD was at the field 13Aug13). So is the Skylancer (*JvH*: see my photo below) and possibly the F-4D Phantom II 66-0266 (*JvH*: The F-4D was 66-0266/SD, present on 13Aug13). *JvH* added: T-28A Trojan N9862C was also on the row of aircraft for sale. Compare 2006 report on WIX forum: Note F-86 53-841 / FU841 was not listed on list above. Location details: "Just before Ontario, on I-84 exit 3." 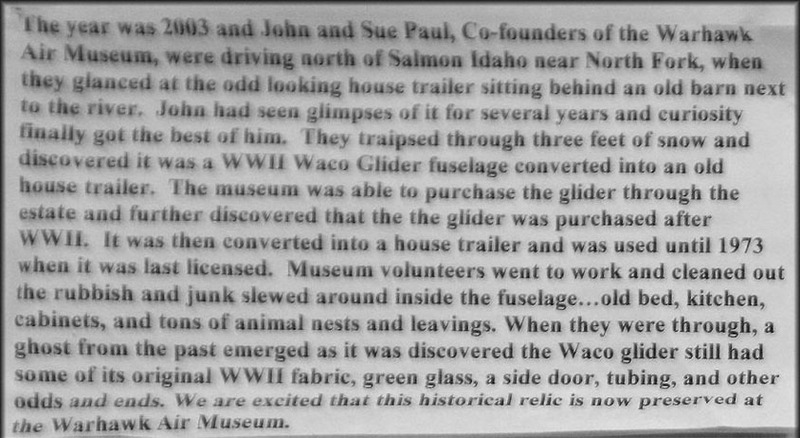 About Merle H. Maine: "he was an avid warbird collector, the Merle Maine Collection was based in nearby Ontario, Oregon. An extremely successful businessman and construction contractor, Merle built a world-class assemblage of classic warbirds which he enjoyed sharing with fellow aviation enthusiasts, his collection being the main attraction of the annual Ontario Air Faire held each fall. While Mr Maine never served in the military, he had a special passion for warbirds, and his love of flying and of aircraft began the day when he took his very first flying lesson, and after he bought his first plane just snowballed, with him acquiring plane after plane. There was no provision in his will for the continuance of the collection and there is no local entity with the wherewithal to take on the expense of purchasing and maintaining such a extensive collection, so one by one the planes are being donated or sold to museums and collections across the country." Johan van Helden visited on 13Aug2013 this collection, which was put outside pending auction the very next weekend! Johan was able to walk around and take pictures. See the compilation below. His comments were added (*JvH*) on the above list. I'm the General Manager at the Warhawk Air Museum in Nampa, Idaho. Sue Paul, the Executive Director, sent me the blog you wrote about the website a few years back. I wanted to send you a quick note to compliment you on your work. Bravo! Perhaps you'll stop by again on your future travels. In the meantime, we just launched our new website which, perhaps, may interest you: www.warhawkairmuseum.org "